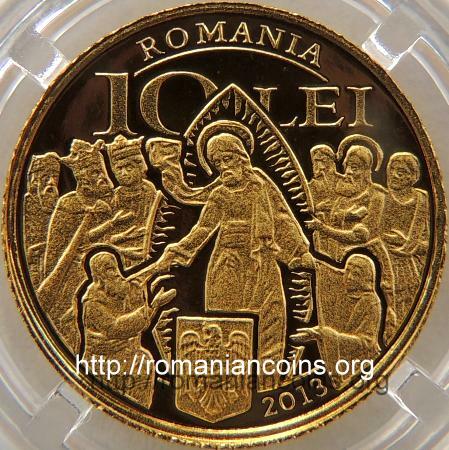 Obverse: ROMANIA, face value 100 LEI, coat of arms of Romania, year 2013, a fragment from the gold cover of the Four Gospels of Hurezi, representing the scene of the Harrowing of Hell (the descent of Christ into hell) Reverse: portrait and name of the prince who donated this book to Hurezi Monastery - CONSTANTIN BRANCOVEANU, depicted next to the Four Gospels book, the main church of the monastery, the pavilion of Dionisie (Dionysos) and the chapel, inscription "TETRAEVANGHELIARUL DE LA HUREZI" meaning "FOUR GOSPELS OF HUREZI"
The Four Gospels of Hurezi is a bilingual evangel, written in Romanian and Hellenic, printed at the Metropolitan Bishopric in Bucharest in 1693, in the printing shop led by Antim Ivireanu (Anthim the Iberian). 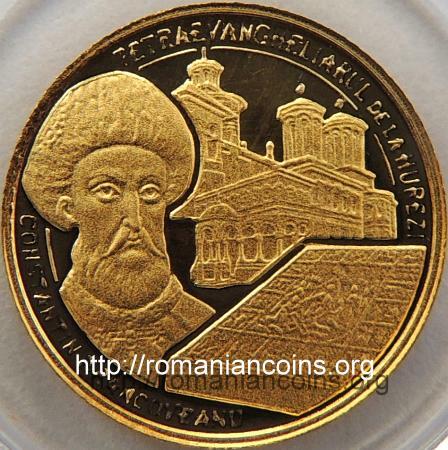 In 1709 Constantin Brâncoveanu, ruler of Walachia, bestowed a copy of this book to Hurezi Monastery . The cover was made of gold, being adorned with several religious scenes, most of them being made using the au repoussé technique. 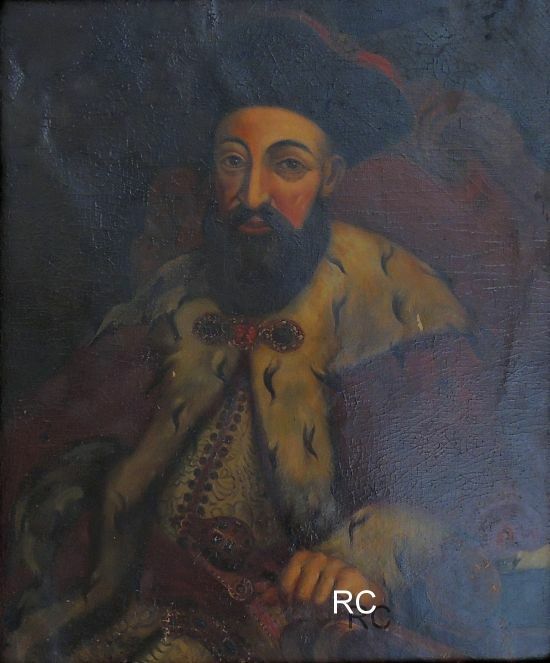 The cover work was made at Sibiu by Sebastian Hann (1644-1713), artisan and goldsmith. The gold cover has approximately 35 on 25 centimeters. The piece weighs 1254 grams . The monastery was founded by prince Constantin Brâncoveanu, being erected between 1690 and 1693. It is placed in Vîlcea county, near the city of Horezu. The main church was dedicated to the Holy Emperors Constantine and Helen. The chapel was built in 1696. In 1753 abbot Dionisie Bălăcescu ordered the erection of a pavilion, that nowadays bears his name. 2. Leahu Doina, Arbunescu Al., Oanţă-Marghitu Rodica, Dumitriu Luminiţa, Mălăncioiu Raluca, Amarie M., Oberländer-Târnoveanu Al., Tezaurul. Ed. Age-Art, without place or year.